This kit comes in a shrink-wrapped end opening type box. I am no fan of this type of box. Invariably, PE frets, decal sheets or other small parts find their way past the end flaps to get lost forever. 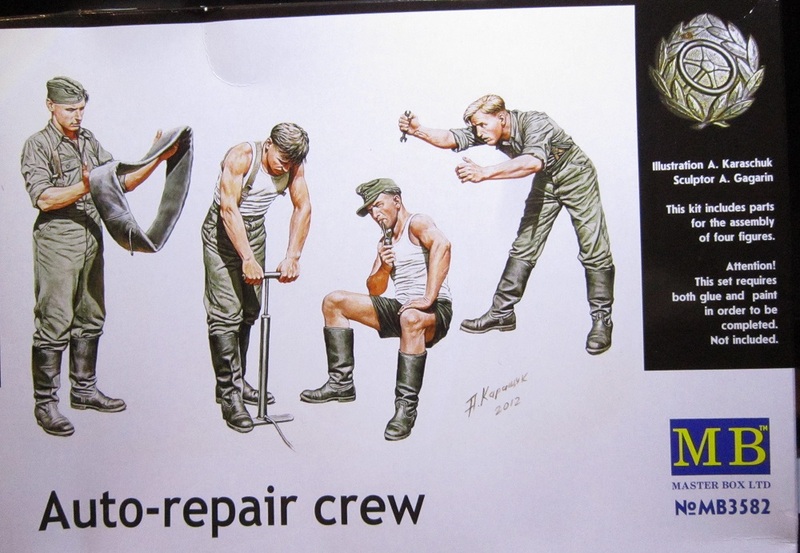 The box art shows the four German auto-repair men posed against an all-white background, similar to the way that Tamiya also does all their box arts. One crewman is standing and holding a tire inner-tube draped across his hands. He is wearing a grey shirt and pants and a grey side cap. His pants are held up by suspenders and are bloused into black jack boots. His sleeves are rolled up above the elbows. The second crewman is bent forward over a tire pump he is pumping. He wears grey trousers with suspenders that are bloused into black jack boots. He is bare armed and wearing a white t-shirt. His head is bare. The third crewman is sitting and smoking a pipe. He wears a grey peaked field-cap, is bare armed with a white t-shirt and black shorts. He has black jack boots also. The fourth crewman is bent forward at the waist and holding a wrench in his right hand with both arms outstretched. He is bare headed and wears a grey shirt and trousers that are tucked into black jack boots. His sleeves are rolled up above the elbows. There is an illustration on the right hand side of the box art of some kind of a badge that has a spoke wheel in the center surrounded by oak leaves. Below that it says that illustrations were done by A. Karaschuk and the sculptor of the figures was A. Gagarin. 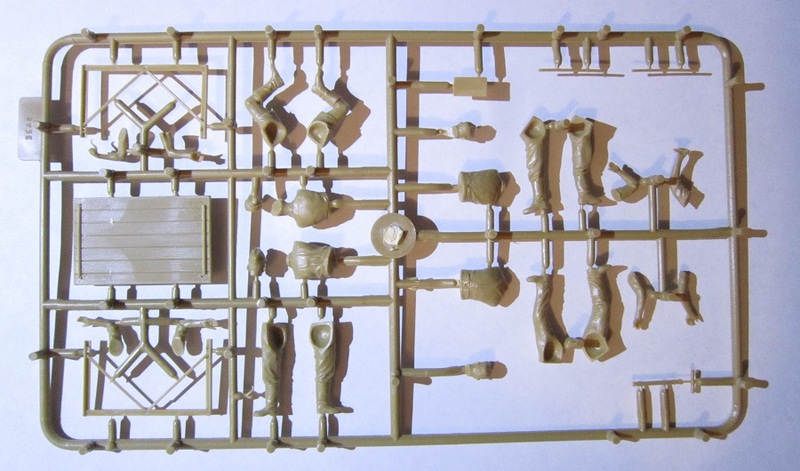 The kit includes parts for the assembly of four figures. The set requires both glue and paint in order to be completed, not included. One side panel says “When working with model glue observe due precautions. Avoid inhaling vapors. Work in well ventilated room. Avoid material getting into eyes, mouth as well as skin exposure. Should contact with eyes occur, immediately wash out with water and consult the doctor immediately! Only for collectors over 14 years old. Warning! Small parts! It is recommended to store the construction set and accessories in a place beyond the reach of children below the age of 5 and domestic animals”. This is said in English, Russian and Ukrainian, marked with color illustrations of the countries that speak these languages. The other side panel says all this again in German and French marked with flags also. One end flap says the kit was made in the Ukraine by Master Box Ltd. and provides their street address, E-mail and web addresses. The back of the box serves as the assembly instructions in full color and a illustration of the parts tree. There is NO tire inner tube for the one figure to hold provided. No chair for the seated figure. 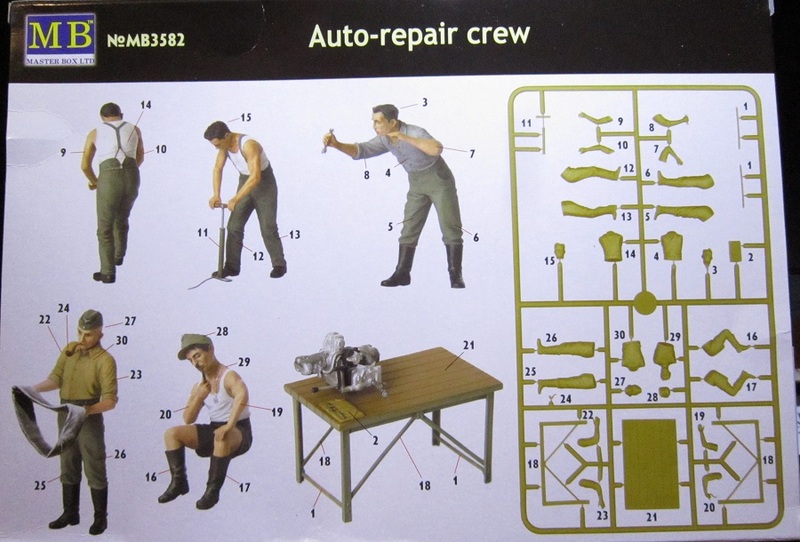 There is a folding wood table in the kit, but the assembly instructions show a motor on top of it. That’s not provided in the kit either. For as high as the price of this kit is for what little you get those items should be in the box. Not to mention some side arms perhaps. This kit was a real disappointment as far as it’s contents. Value VS price paid is not here!! The detail is good. I cannot recommend the kit due to it’s high price and low content. I foolishly bought this kit at my local hobby shop, thinking some of the figures would work in some dioramas I had planned due to their poses.